AUTHORISED AIRTEC UK DEALER Stage1 uprated intercooler for Focus ST Mk2 ST225 Will fit both pre-facelift and facelift models Ideal for standard cars in hot countries, or stage1 mapped cars Available in black, with choice of no logo, or logo colour of your choice Black Pro-Series Generation 3 60mm core Focus ST intercooler upgrade (comes with full brackets and fittings included) Airtec's latest intercooler for the ST225, has now been upgraded and the total design has been re-worked with new high flow 60mm core and smooth flow end tanks, This in turn has increased power, torque & also lowered ATC Temps, this could possibly be the best ST intercooler available. Yes its really that good! Bolts onto the bottom of the radiator cradle so there is not major weight put onto the standard radiator mounts like other alloy intercoolers on the market Torque of the Devil Rolling Road test results Gen 3 Test results 296.4 bhp Brake horse power figure was impressive! 390 lbs/ft Massive Torque curve 148 degree's Inlet Temperture 30 degree's Outlet Temperture Standard Ford Intercooler Test results 275 bhp Brake horse power figure was down on power compared to Gen 3 350 lbs/ft Torque was also down compared to Gen 3 144 degree's Inlet Temperture 66 degree's Outlet Temperture. Please choose a logo colour. Black AIRTEC Logo White AIRTEC Logo Blue AIRTEC Logo Red AIRTEC Logo Yellow AIRTEC Logo Silver AIRTEC Logo Green AIRTEC Logo Orange AIRTEC Logo Purple AIRTEC Logo Pink AIRTEC Logo WITHOUT AIRTEC Logo - Plain. 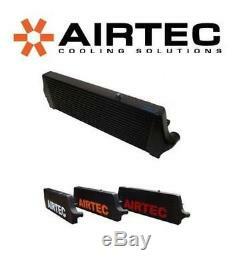 The item "AIRTEC Stage 1 BLACK Uprated Front Mount Intercooler FMIC Ford Focus Mk2 ST225" is in sale since Wednesday, March 1, 2017. This item is in the category "Vehicle Parts & Accessories\Car Parts\Turbos & Superchargers\Intercoolers & Parts". The seller is "dvbaudio" and is located in Biggleswade, Bedfordshire. This item can be shipped to United Kingdom, Antigua and barbuda, Austria, Belgium, Bulgaria, Croatia, Cyprus, Czech republic, Denmark, Estonia, Finland, France, Germany, Greece, Hungary, Ireland, Italy, Latvia, Lithuania, Luxembourg, Malta, Netherlands, Poland, Portugal, Romania, Slovakia, Slovenia, Spain, Sweden, Australia, Canada, Brazil, Japan, New Zealand, Israel, Hong Kong, Norway, Indonesia, Malaysia, Mexico, Singapore, South Korea, Switzerland, Taiwan, Thailand, Bangladesh, Belize, Bermuda, Bolivia, Barbados, Brunei darussalam, Cayman islands, Dominica, Ecuador, Egypt, Guernsey, Gibraltar, Guadeloupe, Grenada, French guiana, Iceland, Jersey, Jordan, Cambodia, Saint kitts and nevis, Saint lucia, Liechtenstein, Sri lanka, Macao, Monaco, Maldives, Montserrat, Martinique, Nicaragua, Oman, Pakistan, Peru, Paraguay, Reunion, Turks and caicos islands, Aruba, Chile, United States.